Gerbils are popular pets and social animals that do best in a happy, companionable group. These are curious and intelligent creatures, but they can also be territorial and aggressive as adults. Even gerbils that have been gentle may fight for dominance when they are introduced to a new cage or other unfamiliar environment as they get accustomed to the new space and seek to claim their own territory in their new living quarters. Fortunately, with a bit of patience, you can easily acclimate your gerbils to a new cage without injuries or anxiety. Cage splitting is often used when adding a new gerbil to an established cage, but it is also useful if you are moving all your gerbils to a new home. This easy technique will reduce territoriality and get each gerbil used to the new cage safely. Before you begin, it is important to recognize when gerbils begin to claim territory. Young gerbils, generally younger than 10 weeks old, are not sexually mature and are less likely to be aggressive or territorial. When the animals are mature, however, they will fight for dominance and cage splitting will be necessary. Carefully clean and disinfect the cage to remove any lingering odors or unwanted contaminants. Be sure the cage is thoroughly dry before making it ready for new residents. Line the new cage with fresh, clean bedding, but do not include any bowls, dishes, dens, toys or other items the gerbils can use for scent marking, the first step in claiming territory. Do, however, there is a fresh, clean water bottle available for each gerbil. Use a thin layer of mesh – ideally a double layer for extra safety – to divide the cage into equal sections for each gerbil, keeping a water bottle in each section. Dividing the cage in half is fine if you have just two gerbils, but otherwise be sure each animal will have a roughly equal part of the new cage to itself. Add the animals to the new cage, letting each one explore its own private space while it can still see, smell and hear its neighbors. Use scatter feeding during this time, which more closely mimics gerbils' natural foraging behavior and will provide them some entertainment and distraction. Switch the gerbils to different sections of the cage at least 2-3 times per day, always moving each animal at the same time and rotating them through each section of the subdivided cage. This will allow the gerbils to get used to sharing the space without territorial fights. Continue using the partitions in the cage for at least 7-10 days, until the adjacent gerbils show no signs of aggression. If they are grooming one another through the mesh or sleeping flank-to-flank next to the mesh, this is a good sign that they are comfortable in the new space. Carefully remove the partitions between cage sections, allowing the gerbils to roam freely throughout the new cage. 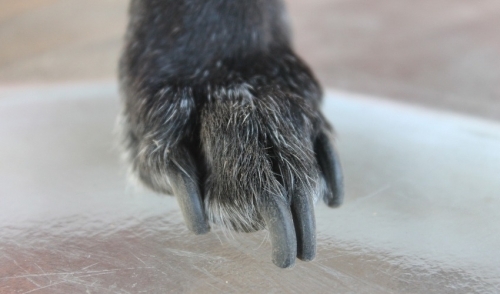 Some minor signs of dominance, such as boxing, squeaking or wrestling, are normal, but if a severe fight erupts, the animals should be separated again. 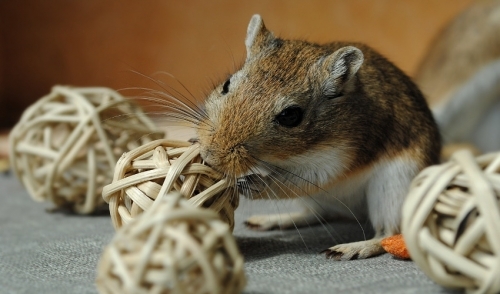 Once the gerbils are comfortable with each other in their new cage, gradually introduce toys, bowls, dens and other gear to their habitat. Do this slowly and allow each animal to use the new items so they are shared equally without aggression. It takes time and patience to introduce gerbils to a new cage, but once these social pets are used to their new environment and have learned that it belongs to all of them, they will once more be the perky, companionable critters you love.